If the United Nations estimates are anywhere near correct, today marks the day the world's population hits 7 billion. Could be off a few days one way or the other, but you get the gist. I actually did a story about this in 2008 - looks like it came a few months earlier than predicted! [Jun 20, 2008: World Population to Hit 7 Billion by 2012] Obviously this is not a 'fast money' trading event, but considering it was just twelve years ago the planet hit 6 billion, it's a pretty amazing milestone. Projections are for another two billion in about 2 generations (2050ish). From an investing perspective the growth of the world's middle class is an important development, as is the wage/labor pressure from hundreds of millions continuing to flood the world's labor markets. Tom Stevenson from Fidelity takes a look at three key outcomes from this, some of which we've discussed quite a bit a few years ago. Note - Nebraska farmland is up 20-30% year over year, as the 'farmland' trade is one of the big long term winners. It is just 12 years since we reached six billion and the growth is set to continue, to nine billion by 2050 it is estimated – that's around three times the number of people on Earth when I was born. These figures would be unimaginable to the pessimists, from Thomas Malthus onwards, who have consistently warned that the world cannot sustain any more people. The challenges presented by such rapidly growing demands on the planet's water, energy resources and farmland are significant. Yet, human ingenuity has succeeded thus far in not just providing for a rising population but massively increasing the living standards of most people. So, while greater affluence is often blamed for increasing the strains on the world's finite resources, it is possible that a richer world may be a more sustainable one because it will cause a natural levelling off in population growth. It is estimated that food production will need to rise by 50pc by 2030. In part this is to do with more mouths to feed, but it is also a consequence of those mouths' changing appetites. As people grow wealthier their diets change and they consume more protein such as meat and dairy products. The second consequence of the current rate of population growth is a rapid increase in the proportion of urban dwellers. In 1950, around one third of the world's people lived in cities but by 2025 it is forecast that 60pc will live in urban areas. The biggest implication of this growth is for infrastructure spending and the raw materials that make that kind of development possible. One recent estimate by the OECD suggested that 3.5pc of the world's economic output needs to be channelled each year into building, or rebuilding, electricity, road, rail, water and telecoms networks. 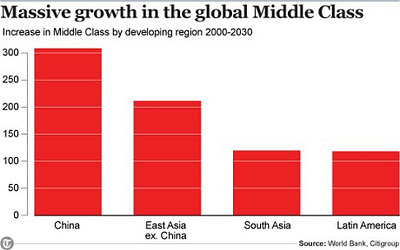 The third big consequence of population growth is a rapid increase in the high-consuming middle class. This group of people, which has moved beyond subsistence to a life in which it can realistically aspire to own consumer goods and spend money on services such as health care, education and finance, is predicted to rise from around 400m to 1.2bn between 2000 and 2030. As the chart shows, much of this will be in just two countries, China and India. Understanding changing consumption patterns is a key concern of investors today. For example, the growing female participation rate in the workforce in many developing markets is important because of women's differing spending patterns. Brazil is already the world's third largest market for cosmetics, fragrances and toiletries. Other areas of growth include financial services – where mortgages and consumer loans are relatively undeveloped in emerging markets like Russia; beverages – Nigeria is now the world's biggest market for Guinness; and, inevitably, cars – the ultimate signifier of "arrival".